How to choose the best cervical pillow? 1 How to choose the best cervical pillow? Can you imagine your neck pain relieved and even gone in just a few days? A high quality (and the right) cervical traction pillow can make this fantasy come true. – And even reduce snoring (by keeping air passages optimal while you sleep). The Therapeutica sleeping pillow, for example, has a 5 year warranty for resilience, which is great. Neck traction pillows come in different shapes. You have the trapeze centered pillows, v-shape pillows, the contour pillows and ones that have a wedge extension to support your upper back. If you’re a side sleeper, choose a pillow that its side-sleeping portions (“side wings”) do not allow you head to slip back to the center while you’re sleeping, or allow you neck to be tilted either up or down. They all have their pros and cons, but some say that memory foam is less than ideal, because as you sleep and the pillow gets warm – Your heads sinks into the pillow and spinal alignment is reduced. Foam will feel “harder” than Polyester but will support your neck a bit better. For example, the popular arc4life cervical linear traction pillow is stuffed with Polyester fabric, while the Therapeutica pillow is made with foam. Resilience – The Therapeutica pillow is made with foam, which is dense and won’t crumble easily. In any case, this pillow has a 5 year warranty for not losing shape and resilience. Pillow Cover – The Therapeutica comes with a free fitted polyester/cotton machine washable zippered pillow cover. Sizes – The Therapeutica comes in sizes large, medium and small. Price – The best price was found on Amazon about 70$. It may seem like a lot of money for a pillow, but can you really price dramatic neck pain relief? This pillow is very comfortable to sleep on, while aligning your neck and spine – Either on your back or on your side. See more real user reviews on Amazon. Sizes – The different sizes are for the size of your bed. Large would be for King, Medium for queen or full, and small, twin or single. It only has to do with how wide the pillow is. A standard size pillow would look a bit funny on a king bed, for example. Material – The arc4life pillow is a sewn pillow case stuffed with polyester fiber, which is non allergenic. ** Comfort – The pillow keeps your neck in proper alignment so it’s awkward, but after a couple of nights, it becomes very comfortable. Price – The arc4life price depends on the size of course. The small size (not recommended) is about 59$, the large size is the same price as the Therapeutica pillow –About 70$ on Amazon. Through our research, The arc4life traction pillow is quite comfortable, and is especially well fitted for people sleeping on their back. It takes a couple of nights getting used to, but then becomes very comfortable. If you are a side sleeper, you should know that the side wings are not firm enough to keep your head in them and you may find your head slide back to the center (and out of alignment) when you’re side sleeping. Material – The pillow is made with 100% cotton and stuffed with fortrel fiber. Comfort – The Tri-Core pillow comes in 2 firmness levels. The large one is about 3-4 inches high (lifting your head). Price – The price for the Core-200 is reasonable, at about 40$ on Amazon (26% discount right now). I hope you’ve find these traction pillow reviews helpful. Through our research, the 3 above are the best neck pillows in the market right now. 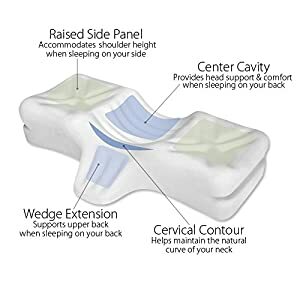 We recommend the Therapeutica pillow most – It has a 5 year warranty for losing shape, it seems the most comfortable one and the extra wedge supports the upper back like no other pillow does. It has the highest user ratings on Amazon right now – You can see them here. What do you think about cervical pillows? Are they worth the price?